Our Club has had a fantastic start to 2017, with over 50 girls training on Friday and Monday evenings from 6:50-8pm. The enthusiasm is terrific with several mentors helping to improve skills and fitness. There were a few changes to our Committee at our recent AGM. Much praise and thanks were expressed to Cait MacManamon (outgoing Secretary) and Paddy Lucey (outgoing Chairperson) for their commitment and support in helping to develop Ballincollig LGFA into the vibrant Club it has become. Last year was a very positive year in the Club in many ways. 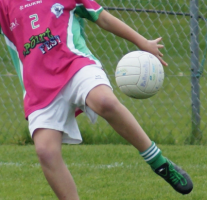 We ran a very successful Gaelic 4 Girls programme which introduced over 100 girls from all the local Primary Schools on the basics of Ladies Football, while having exercise and great fun. Our Under 10s and Under 14s were very successful in their Leagues and our under 12 girls and our Minor ladies were crowned Mid Cork Champions. With all this in mind, we are looking forward to our Celebration Party, which will be held in the GAA Club on Friday, 3rd March from 7pm – 11pm. It is a night to put away the shorts and tracksuits and glam-up for a great night with your friends, family and Team-mates. Mid Cork Medals will be presented to both Under 12 and Minor Teams on the night, followed by a DJ. More Information to follow, so be sure and put the 3rd of March in your Diary!! Club gear will be on display during Registration and can be ordered also at that time. These girls are already into their 3rd week of training and preparing in earnest for their leagues which will begin mid-February. Our Under 16 ladies will have their first Challenge match of the year in the next 2 weeks v Nemo. Training continues every Friday and Monday from 6.50-8pm. New members are always welcome. All girls have been informed that they MUST wear GUMSHIELDS at all times on the Pitch. As and from January 2017, any girl who forgets her Gumshield WILL NOT be allowed train under any circumstances.